Last updated: March 10 2016. 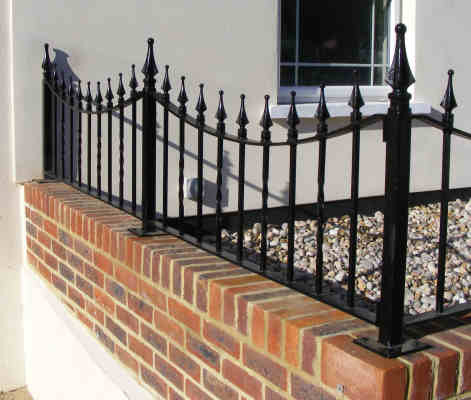 The term wrought iron railings is often a very broad term, used to encompass, such things as stair railings, hand rails, balustrades, balcony railings, even wrought iron fencing and of course garden wall railings. 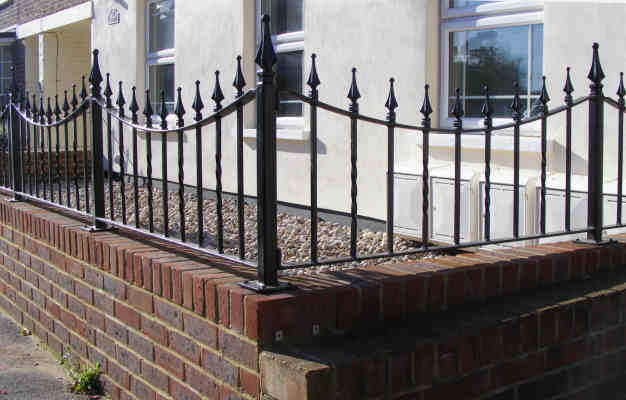 Balconies, stair railings and balustrades are usually subject to building regulations and as such it is important, that any metal railing designs meet the current building regulations. 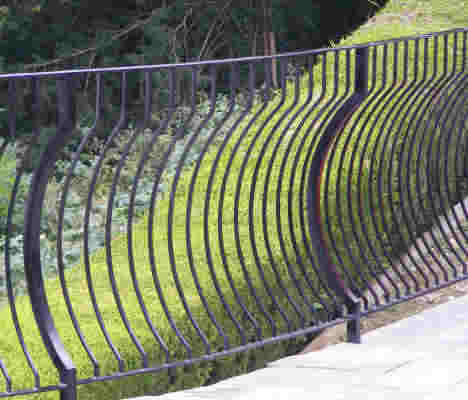 A well made and designed wrought iron railing or wrought iron fence can enhance the look of any property, as well as providing better security. 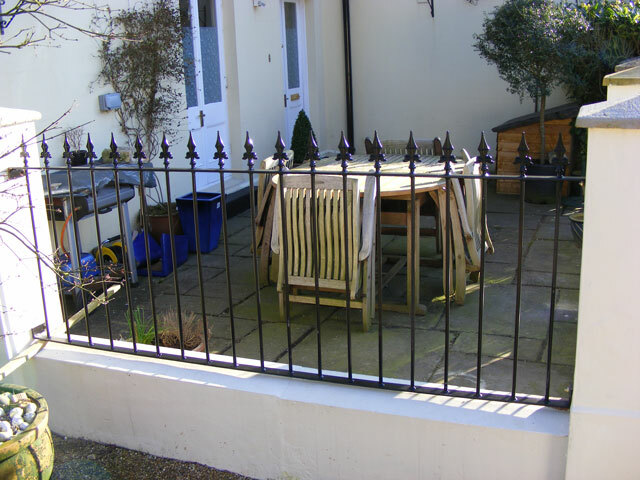 Bow bar railings or spanish bow as they are sometimes called made to follow the curve of a patio area. Posts are curved to the same shape as the railings, posts are from 40 mm square solid bar, giving a solid post with crisp edges. Below the paved patio is a concrete base to which the posts are bolted. The paving was then cut around the steel post, making the post fixing invisible. Each fencing section is welded to the next, so as there are now joints or fixing brackets to spoil the look. 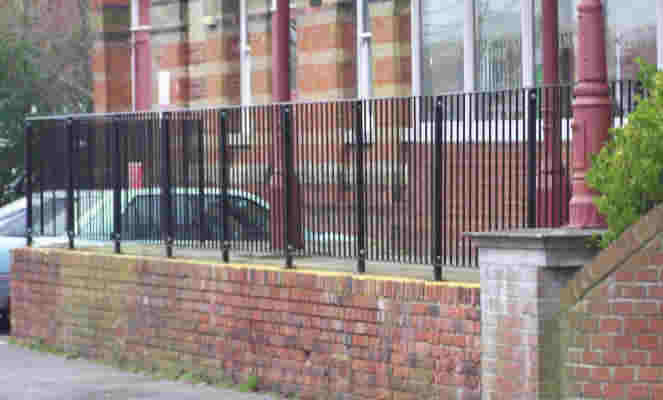 Metal wall railings with steel posts, used in place of brick piers on a flat wall. 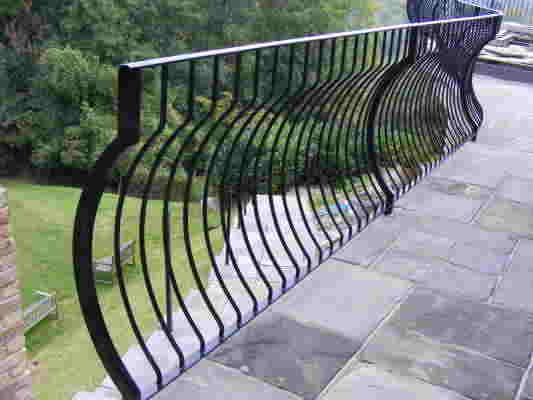 Each section curves / dips down to give something different from the normal style flat railings. Posts are bolt to brick work, via a steel fixing plate. 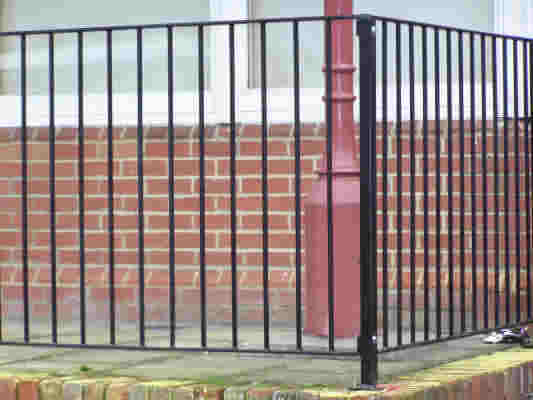 These wrought iron railings use a blunt type railing head due to there low height. 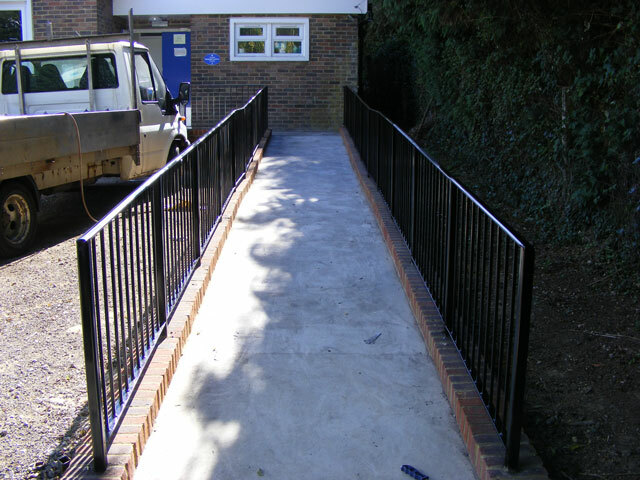 Hand rails on a disabled access ramp in coolham. Plain and simple but compliant with building regulations. This hand rail follows the slope of the ramp while keeping the the vertical bars upright at 90 degrees. 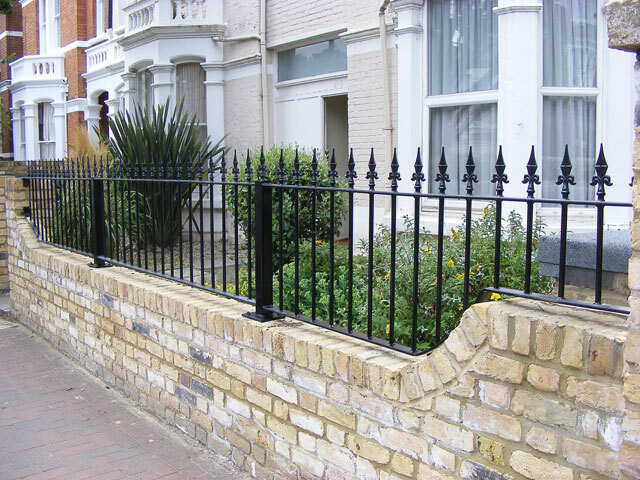 Walling railings in Putney, London, built to fit wall shape, with decorative railing heads. 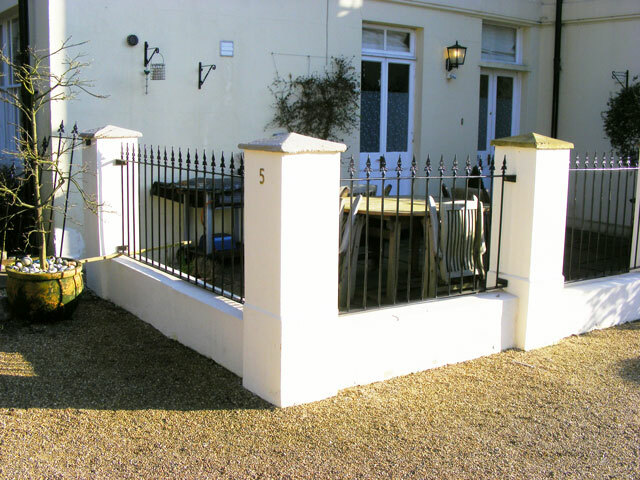 Due to the length, posts were needed to provide support for these wrought iron railings. Use of steel posts to provide support on long sections is an easy way to avoid large numbers of brick piers. 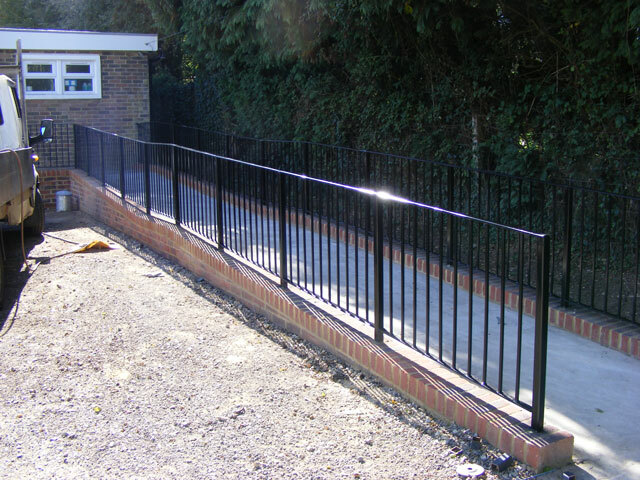 Wall railings fitted between brick piers in Kent. The white rendered walls sets of the contrast of the black metal work. 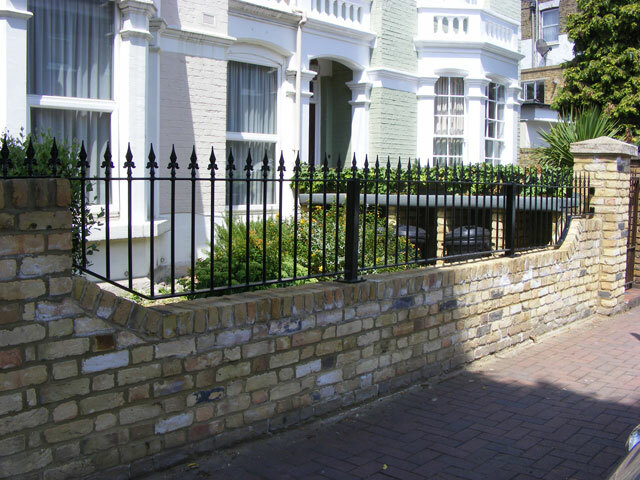 All metal and steel ornamental balustrades,wrought iron railings and fencing we craft are made to order to customer specification and design, be it a modern or a victorian railing design. They can be made for exterior or interior use. We can also make security grills for windows and doors.